ISK-KA's fabric company has partnered with WWF Italy (World Wildlife Foundation) with the mission to conserve the environment, safeguarding the wide variety of animals, landscapes, and biodiversity of the Mediterranean Sea. The collaborative collection of swimwear was photographed by Maya Fuhr, who spoke with us about drawing inspiration from classic Italian cinema and the process behind her work. Where did the idea for this shoot come from? I was thinking about ISK-KA and what the brand stands for. The fabric was made in Italy and represents timeless sophistication and fits any woman with naturally curvy proportions. My mind jumped to the scene in La Dolce Vita when Anita Ekberg is flirtatiously bathing in the Trevi Fountain. I had this poolside location in mind and it all came together in a really cool, serendipitous way. 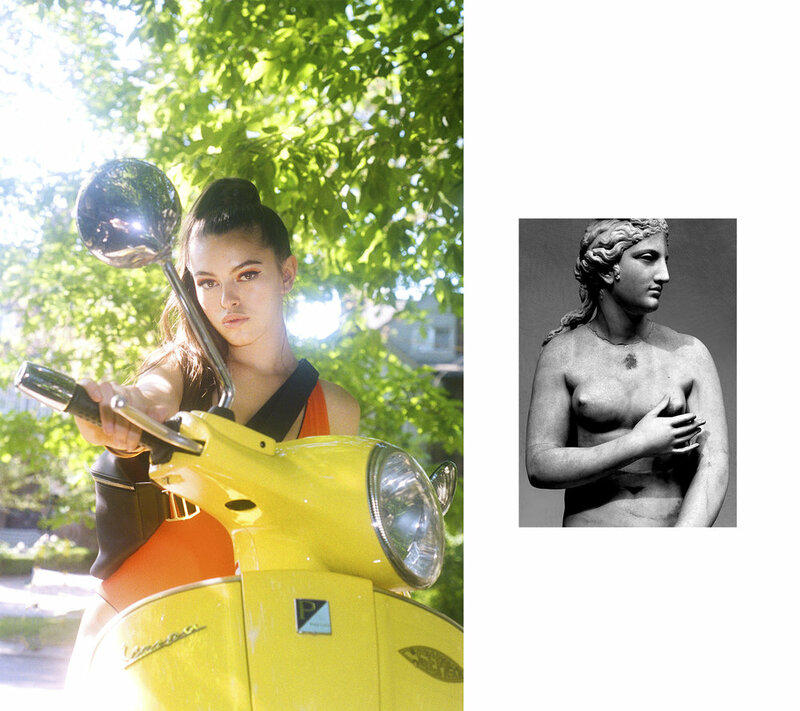 I matched the models with statues to celebrate the iconography of beauty and to bring back ideals of the past. Where does your interest in Fellini and and La Dolce Vita come from? I first watched Fellini films in film school back in 2008. I was completely obsessed with the soundtrack especially. Now I'm actually living "la dolce vita" in Brescia, Italy, at an art residency (Palazzo Monti) and his films keep reoccurring in my head. Italy's colour pallet and beauty is indescribable—I actually can't believe Fellini chose to shoot in black and white. Was black and white film something you thought about incorporating? Color is a big part of my photography so I don't really mess with black and white. The swimsuits are also such cute colors; I wanted to highlight their vibrancy. What was behind your decision to pair the photos with images of classical sculptures? The statues are shapely goddesses, which is how the designer Rachel Fox hopes you feel in her bathing suits. I found that to be true this summer when I wore them. I think it is funny that even though those sculptures were made centuries ago, I still have captured the same feminine, casual poses in my fashion shoots. A lot of your fashion and documentary work is very contemporary and focuses on youth culture, while this project includes many more historical allusions. Are the two connected or are you experimenting with something new? I am always experimenting! My name actually means "allusion", so it is funny you say that. I don't want to be in one narrow niche of photography or have people expect a specific genre of work from me. Depending on the brand I am working with, I am always bending and tweaking. When you are working on a shoot like this, do you plan every step meticulously or do you like to work in a more spontaneous way? In my fashion work, it is always insanely spontaneous—I move around like a snake. I like to see how the model moves when she is more comfortable. Sometimes I will recreate a moment I observed ten minutes earlier—for example, when she is getting her hair done or eating lunch... the off moments. I want to capture their overall essence so the finished product is inherently instinctual. Do you have more projects like this planned for the future? Yes, I have a hundred things on the go right now. I am making ceramics here at my art residency so these will most likely be paired with my photographs in the future.